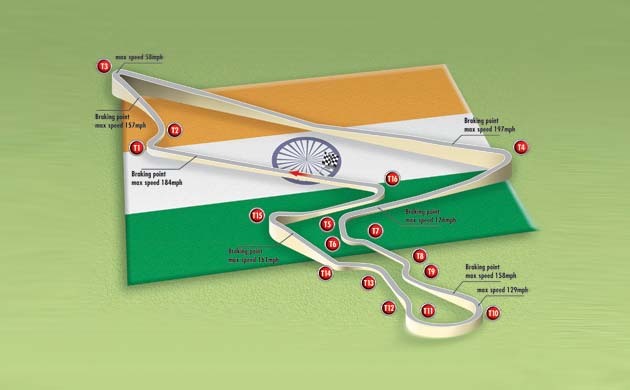 Indian track consultant, Vicky Chandhok, for the Indian GP in Delhi, tells F1 drivers would be enjoying a combination of elevations, corners and long stretches that constitutes the design of the Indian GP track. When asked if Indian GP circuit would be any different from other circuits in the world, Chandhok says that the FIA had been doing thorough research on improving overtaking manoeuvres and take racing to the next level from a racing and spectators’ point of view. While the research was underway, FIA had come up with designs in new corners, which looked encouraging for overtaking. He told the GP track in India would be the first to follow the new specifications outlined by FIA (Federation Internationale de l’Automobile). He says the track designs were done a bit early, but there were changes made pertaining to 3 corners that were designed wider. He told the uphill changes, exciting corners and long stretches (1.2 km) through 3rd and 4th corners would be making the race more exciting. He told the circuit would have a mix of slow speed, high speed and medium speed corners and told the combination was rare to be found in a single circuit. When asked if the cars would be seen going faster he says he’s very confident of that saying drivers would be enjoying racing overall, particularly the corners. He gives an example saying the changed 3 corners would have a shorter entry, but wider exits that would be helping cars get out of corners much quicker at higher speeds. This would be encouraging for the overtaking cars to get close to the cars at corners and make a move faster as they exit out of the corner. When asked about Charlie Whiting’s (Race Director) reactions on his visit on the 1st of September, Chandhok answered he’d been in association with Charlie from day 1 of his visits here. He told he’d been in a close working relationship with Charlie regarding the whole circuit. Charlie told him it had indeed exceeded his expectations as he’d expected more tension and panic surrounding the ongoing work. Chandhok was pleased with accolades showered by Charlie when he told whenever something was told for a specific job the team had got things done on time, and this was evidence enough about Charlie’s impression preparation wise. When asked about the designs done by Herman Tilke that had been monotonous and not a treat to the spectators, Chandhok answered critics were right in pointing at Tilke. Vicky questions about the impression one gets looking at Canada and Monaco circuits like how different are the circuits; when as a matter of fact, corner speeds of the cars were very high currently and a car’s grip had been so crucial in racing that overtaking the car ahead was becoming more difficult. Vicky says DRS implementations have brought in more excitement to racing, though criticised by some drivers with the issue still ongoing. He assured that the advantages of the GP track in India were that it was viewable from any given spectator stand when compared to tracks that were earlier designed by Herman Tilke. Sameer was very particular about spectator viewing feasibility from day 1 of the project. Chandhok further assures it would be a spectator’s delight to be watching the race. When asked about his favourite part in the circuit, Vicky says he liked the elevations found at a number of places and that it makes racing special here in Delhi. He told when it came to a driver’s perspective, they’d be enjoying the three newly made corners and the stretch when they come into the chequered flag. When asked about the preparations for the race, he says the track’s neared completion. He told arrangements were being made about fitting grandstand seats, and it would be finished shortly. He told he wasn’t involved in the rest of the things, but is very excited to hear and see the hype surrounding the event. When asked about involving with a private firm for assistance regarding the event was good enough, he says he was. He says JPSI went ahead about building and structuring as a business model. He says the Government-owned structures weren’t that good in the country saying nobody was concerned or answerable if something went wrong in a given project whereas in private bodies things were run as part of commercial business with one individual answerable to the situation. He tells the boss had his final word in any undertaking when it came to private entities. The boss demands excellence in workmanship and usually gets in done with decision making process quicker aiding in completion of a project much sooner. Finally, when asked about India’s morale hosting a motorsports event, Vicky says he hopes whoever’s involved in the event use the opportunity well as motorsports’ growth in India is rising and that officials and organisers needed to invest on their own knowledge. He feels organisers need to step in early, visit and observe overseas events and plan thereafter regarding the steps to be taken. Now, this event would be serving as an opportunity for them to gain firsthand experience when the proceedings for the event happens right here in India. He feels events and competitors needed to be giving better facilities than in the previous years. He also feels organisers should be stepping up and stopping age-old implementations of ideas and get more innovative. Vicky feels national championships held in the country whether two wheeler or four wheeler events needed to give better facilities.